After waking up with a sickness, I was naturally immediately concerned about our plans to go to the elephant park in the morning. Out of all the things we had planned for our trip, it was the day I was most excited for. I couldn't be sick. Still, anyone who travels in Southeast Asia knows that food borne illness is anything but an unlikely occurrence. I hoped that with a little more sleep I would wake up and be OK for the day. But then Megan's alarm went off and I knew I wasn't OK. I felt lightheaded, weak, and really not prepared to spend my day playing with elephants. But I wasn't about to give up and miss the day as a whole...I blame the stubborn German in me for that one (sometimes I really am my father's daughter). I was still sick to my stomach, but I somehow managed to take one of the most miserable showers of my life and get myself somewhat ready for the day. We were getting picked up at 8:15, and at about 8:12 I was sick again. TMI? Sorry. I looked at Megan and didn't quite know what to do. She suggested we ask if we could reschedule. But we already had things we needed to do our next day, so I didn't want to try to push it back and throw the rest of our plans off schedule. We just didn't have enough time in Chiang Mai, and who knows if they even could have accommodated us the next day. So what did I do? I went outside and got into the van. Of course, out of all the people in our group, we were the first people they picked up, which meant an extra long ride for us. I sat there continually eating mints (the only things that ever settles my stomach when I'm sick...not sure why) and praying to God to somehow miraculously get well enough for the day's activities. I had a moment where I told Megan I didn't think I could do it. I was contemplating my options--either get out of the van then, or wait until we got to the park and then try to get a taxi back to the hotel from there. But I waited a few minutes, and my prayers must have been answered because somehow along the lengthy ride along Thailand's back roads, I started to feel OK.
By the time we got there I really thought I was going to be able to do it. And I did. I didn't feel great that day, but I wasn't sick, and for that I'm truly thankful. The elephant park we made reservations with was Baan Chang Elephant Park. This park takes in elephants that were previously used in other industries such as logging (I never knew this was common, but it is) or the elephant shows that are common throughout Thailand. Elephants in these shows are often made to paint, dance, or do other gimmicky things. At Baang Chan it's clear that the elephants are well-taken care of and live all-around comfortable lives. When we arrived at the park we were given clothes to change into, then we gathered with our group and got to feed the elephants. It was pretty cool to get to be so close to the elephants--they have way more hair than I ever imagined. We also loved how they could eat a whole bunch of bananas at once. They eat A LOT! After we fed the elephants, we gathered with our group and learned how to get on the elephants. After we all mastered that move, we learned a few of the commands to direct the elephants (straight, turn, stop). After we all had a chance to practice, it was time for lunch. Our group's leader called this elephant Lady Gaga because of her long eye lashes. Too funny! 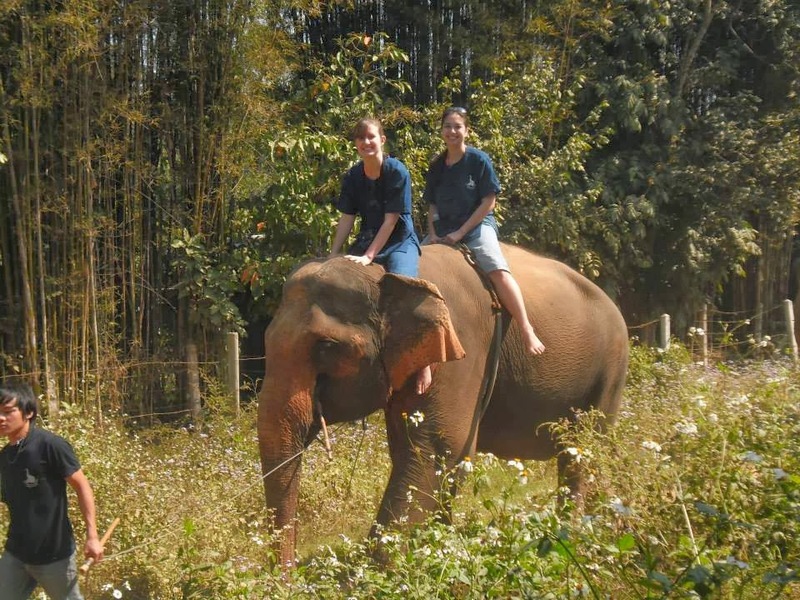 Oh hey, I'm on an elephant! I didn't eat much at lunch, mostly because I didn't know what my body's reaction to food would be, but I ate a little rice as we chatted with some of the other members of our group. After lunch we all met up again to get assigned to an elephant to ride for the afternoon. After that, we got on our elephant and we were on our way! It was quite amazing to be on an elephant riding through the back woods of Thailand. Megan and I kept asking ourselves "Is this for real?" When we met freshman year of high school we definitely never in a million years would have guessed that we'd be riding an elephant in Thailand, but that just goes to show how awesome life's unpredictable moments can be. Our view as we rode the elephant...amazing! We stopped halfway through our ride and got some elephant kisses. If you can't tell by my face, it felt really weird! There we are! Just riding an elephant in Thailand. After we rode for about an hour we reached our final destination for our last activity...bathing! The elephants all got into the water like it was the most refreshing thing ever. The water was cold, but good thing we had our bathing suits on because we got soaked! The elephant's mahouts thought it was funny to target Megan and me, so just about every time we turned around the elephants were squirting water at us. I was freezing, but seriously, when else in my life am I ever going to be squirted with water by an elephant? Giving our awesome elephant a bath! Notice all the elephants in the water behind us...so cool! After we finished bathing the elephants, we headed back to the main part of the camp to get cleaned up before they brought us back to our hotel. When we got home I was totally wiped. I took a shower and laid down in bed and instantly fell asleep. I slept and slept, but woke up at one point, at which I talked to Megan for a while and acknowledged that I should probably get up and eat something, but I just didn't feel like I could even move. Never mind the fact that there was nothing I could think of that even seemed appetizing to me. So I slept. And I slept until at least 8 the next morning. I actually woke up one more time and was sick again, but thankfully that was the last time. When I got back to Korea and told my friend I got sick he said "Yeah it's your first time traveling around Asia. Of course you got sick!" And actually, I should have known it was going to happen, especially given the fact that I tend to have a weak stomach anyway (ok, if you know me you know that's the understatement of the century). But I should have been more prepared, because actually it was one of the millions of pre-travel thoughts that raced through my mind from time to time. Needless to say, next time I travel I will be more prepared, not that I'm sure any medicine can ever really protect you from that kind of illness. All in all, I'm really just thankful that I was well enough to participate in that day because it was really an awesome experience.